You may have an extremely sore painful heel, be struggling to put your foot down in the morning, be suffering from plantar fasciitis or achilles tendinopathy and have done some googling and seen that “Shockwave Therapy” is a treatment option available to you and thought what even is that? What injuries might it help? At Foot Centre Group we have recently invested in a Chattanoooga radial shockwave treatment machine. I also attended a two day conference last week “LASEM heel pain symposium” which discussed all things heel related (in much detail!) and had the pleasure of listening to Dr Peter Malliaras who is an Associate Professor at Monash University. He also practises as a specialist physiotherapist in the area of tendon pathology and writes a fabulous blog disseminating evidence (aimed mainly at clinicians) https://www.tendinopathyrehab.com/blog focusing on current treatments of tendon pathology. Peter is a big advocate of using Shockwave therapy in his clinical practice as part of a tendon treatment management plan. 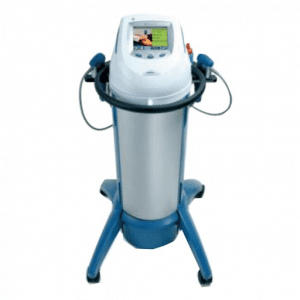 Shockwave is used in a variety of medical settings. “Focused” shockwave therapy uses ultrasound waves focused in on a targeted tissues, such as kidney stones to break them into smaller pieces. The waves begin from a wide source and converge into a focused target (see diagram below). Our shockwave machine uses “radial pressure wave therapy” which delivers energy into tissue in ultrasound waves, which come from a focal source and dissipate into wider waves (see diagram below). These waves cause direct mechanical perturbations to the tissue. The peer reviewed research evidence is still building, and we still don’t fully understand how shockwave works. It is thought that treatment of the affected area enhances and “resets” the healing pattern, while reducing pain and therefore improving function. The physical effects of radial pressure waves are thought to be: pain reduction, increased metabolism, a revascularization effect where the renewed blood flow may promote tissue healing and regeneration, and potentially increase muscle tone as you can complete more rehabilitation with less pain. What we do know, is it has been proven to reduce pain, especially with diagnosed plantar fasciitis. What Injuries may it help? 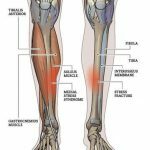 Sports indications: peroneal tendinopathy. Medial tibial stress syndrome, Osgood-Schlatter, Soft tissue tears, Achilles tendinopathy. As stated previously the research is building to support radial shockwave therapy. A huge meta-analysis conducted in 2018 (Babatunde et al.) found evidence to support that shockwaveherapy is better than placebo treatment when treating plantar fasciitis. It has proven that people’s pain can be reduced using the modality. Research has also proven there is no major safety concerns with using the modality (NICE: national institute for health and Care Excellence). Much research for “how” does this modality reduce pain has focused on animals and we can only extrapolate that the same results will be proven in human tissue e.g the increase in metabolism and revascularization. It is important to be assessed and diagnosed properly. Shockwave could be very beneficial to you if your plantar fascial tissue pr your achilles tendon is actually thickened as determined by ultrasound, or clinically assessed by your podiatrist. It could certainly assist with decreasing your pain and hastening the resolution of your injury. It could allow you to be able to complete your rehabilitation exercise to strengthen your tendon to make it more resilient to injury. Come and chat to one of our podiatrists and we can determine if it is a worthwhile inclusion as part of your treatment plan. If you have any concerns regarding a foot concern give me a call on 9553 0044 or book online here. We will be able to give you the best advice to ensure you give your feet the very best care they deserve.